The stages is set for the greatest battle ever fought on the continent of North America. 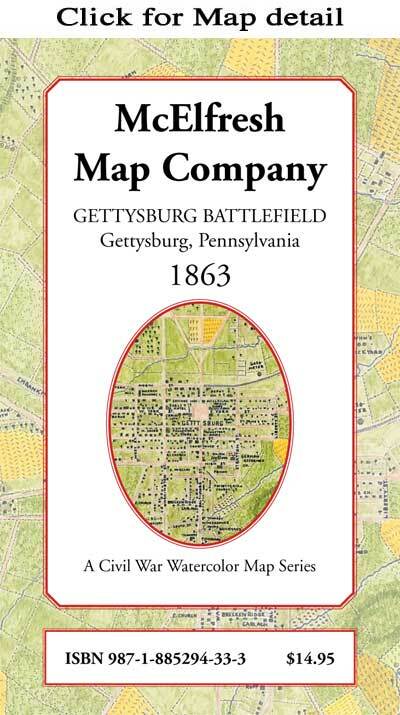 Map Image: 21" x 30"
Overall size: 23" x 33"
Reverse Side: Full color reproduction of six contemporaneous Gettysburg related maps either used or prepared by topographical engineers. Also, informative captions and striking wartime photographs of the principal Union and Confederate mapmakers on the field, G.K. Warren, Jed Hotchkiss, William Henry Paine and Washington Roebling. Packaged in reusable plastic sleeve. A History Book Club Selection.